Could a Resource-Strapped IRS Handle Tax Reform? As Republican leaders in Congress work to push through a major tax overhaul before year’s end, there’s no indication they intend to reverse a six-year trend of funding cuts for the very agency that would have to implement their tax plan: the Internal Revenue Service. The $11.1 billion IRS budget being considered for fiscal 2018 represents a $110 million cut to the agency, reducing funding to 2008 levels. 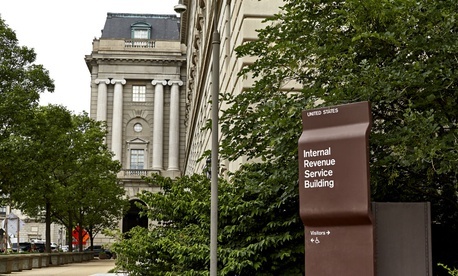 Many in the GOP seem to view the IRS as little more than a politicized relic of the Obama administration. Republicans have not always viewed the tax service that way. When President Reagan worked with congressional Democrats over the course of two years to produce what became the landmark 1986 tax reform, more lawmakers bought the argument that the “IRS is the only major revenue-raising agency in the country, and each dollar added to the IRS budget produced a budget return at that time of $5-7,” former Internal Revenue Commissioner Lawrence Gibbs, now a senior counsel at Miller Chevalier, recently told Government Executive. What’s more, if the GOP tax reform proposals become law, it will fall on the IRS, along with regulatory policymakers at the Treasury Department, to rewrite the tax forms and guidance taxpayers rely on, reprogram computer software to account for the changes, and train staff to enforce the new code. “There is no higher IRS priority than implementing statutory mandates, whether or not they’re funded,” said recently retired Internal Revenue Commissioner John Koskinen. But while the agency would be able to implement tax reform, without additional funding it could very well come at the cost of degraded taxpayer services, compliance enforcement and critically needed computer modernization, he stressed. A Government Executive canvass of lawmakers on the House and Senate appropriations and finance committees suggests that Congress has been more concerned with changing the tax code than with tending to the needs of the agency that would implement those changes. Senate Appropriations Committee Chairman Thad Cochran, R-Miss., according to a spokesman, believes “it would be premature to speculate what the final fiscal 2018 funding level will be for the IRS. Chairman Cochran hopes Congress and the administration will soon reach a budget agreement that will permit appropriators to complete fiscal 2018 bills and give federal agencies greater budget certainty,” particularly when it comes to providing IRS the resources to help taxpayers in rural areas, he said. For all the passion Republicans are bringing to the debate about income distribution and corporate investment, those concerns for the most part don’t extend to the impact a massive tax code rewrite will have on an unpopular agency. The draft reform bills “are not very well thought out,” said Leonard Burman, a founder and senior fellow at the nonpartisan Tax Policy Center who also teaches at Syracuse University. “People at the Tax Policy Center have been flagging all sorts of flies in the ointment, even when taking the bills’ ostensible purpose as valid,” he said. Originally Gibbs’ pleas for more funds fell on deaf ears. But influential writing by C. Eugene Steuerle, the current Urban Institute scholar who in the mid-1980s was the economic coordinator and original organizer of Treasury’s tax reform effort, helped Gibbs change some Reagan administration minds on the ability of the IRS to provide a revenue return on an appropriations investment. The context also figured in Congress’s change of heart. In 1985, before Gibbs arrived, the IRS had run into problems with new computer software designed to help it process returns, pay refunds and update master files. “Eighty million taxpayers didn’t get their refunds” on time, he recalled, noting extensive press coverage of the debacle. Because “constituents understood what it meant to have a problem at IRS, Congress was willing to provide additional funding,” he said. But additional staff alone won’t solve the challenges of tax code complexity. In addition, the bills’ dramatic changes in international taxation, Burman said, “are very complex” and tough to interpret to keep policy fair and reduce opportunities for tax sheltering. Treasury “will need more resources and may even have to renegotiate treaties,” he said.